Anthony Burgess wrote articles about Shakespeare’s language, reviewed books about Shakespeare, compiled a speculative biography, wrote a TV series, set Shakespeare’s text to music and composed a ballet suite based on Shakespeare’s life called Mr WS. 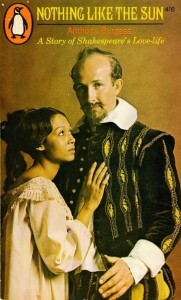 In 1967, Burgess was invited to meet Hollywood actor/director Bill Conrad to discuss the production of a musical film about Shakespeare in love. 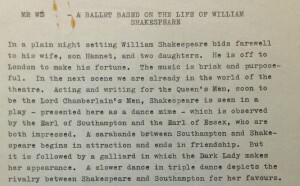 Originally called The Bawdy Bard and loosely based on Nothing Like the Sun (1964), Burgess drafted a film script for the project along with twenty songs featuring Elizabethan instruments such as shawms, sackbuts, recorders and tabors. Mr WS is one of Burgess’s most accomplished and more ambitious compositions. Comprised of nine movements for full orchestra, the suite is around 36 minutes long and combines musical form and instrumentation from the Elizabethan era with the tonality and compositional styles of early 20th century English composers and Hollywood film-music composers such as Miklós Rózsa and Elmer Bernstein. The Prelude is a bustling movement which opens in C major and depicts Shakespeare’s departure from Stratford, his arrival in London to make his fortune and his meeting of the Earl of Southampton. Burgess describes the movement as ‘brisk and purposeful’ and the score features sweeping string melodies, martial themes (including a theme also used in Burgess’s Manchester Overture and Mediations and Fugues), bursts of dissonant brass chords (suggesting horror at the sight of plague-ridden corpses) and a grand climax in the style of a post-war Hollywood epic opening credits sequence. The lively Prelude is followed by a slow Sarabande for muted strings with polyphonic texturing. The third movement is a short Galliard (an up-tempo triple-metre dance popular in 16th and 17th century Europe) in which the Dark Lady makes her first appearance. Burgess’s orchestration moves from a small Elizabethan-style court ensemble to full orchestra. 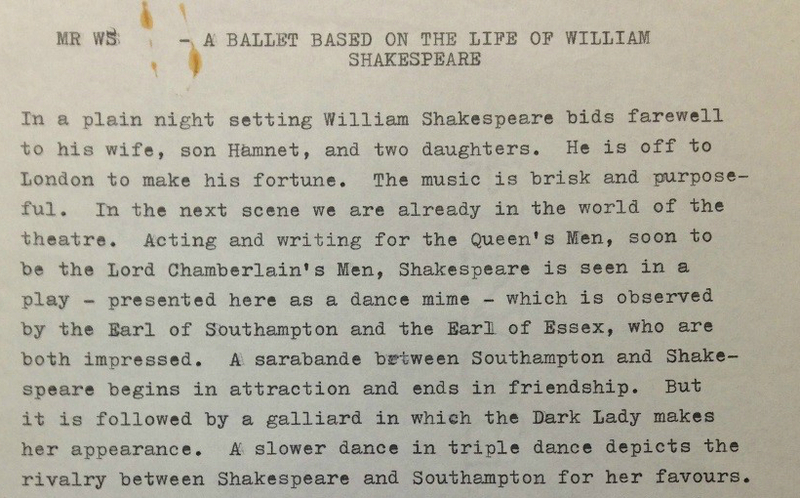 In the fourth movement (a Carol or ‘slower dance in triple’) Burgess depicts the rivalry between Shakespeare and the Earl of Southampton as they try to win the Dark Lady’s affections. Here, Burgess makes use of dual and triple rhythms alongside romantic melodies which gradually build across the oboe and strings, resulting in luxurious modal harmonies reminiscent of Vaughan Williams. The Quodlibet (movement five, latin for ‘what you please’ and traditionally a composition in which well-known melodies and texts appear in various combinations) mirrors the musical style and livelier pace of the first movement and in keeping with the form features a quotation from Browning’s The Leaves be Green, which Burgess playfully develops with syncopated rhythms. Tragedy dominates the sixth movement (The Death of Princes) as a repeating two-note funeral-march motif, building in intensity, portrays Shakespeare’s turmoil following the death of his son. Following his collapse at the dance, Shakespeare is on his deathbed in the opening of movement eight Stratford, 1616. A solo violin towards the end of the movement once more symbolises mortality, with the gradual fading-out of the music mirroring the playwright’s final moments. The suite’s final movement is a march titled Non Sanz Droict (after the motto on the coat of arms granted to Shakespeare’s father in 1596) and features rousing military-band-style passages and a central theme which quotes Burgess’s self-titled ‘mixolydian melody’ taken from his lost Symphony No.1 in E major. Mr WS premiered in 1979 during a national BBC broadcast with the BBC Orchestra. An abridged version of the suite was also recorded by the BBC Scottish Symphony Orchestra in 1994 and featured in the BBC Radio 3 broadcast of An Airful of Burgess during the same year. The complete score is kept in the archives at the Anthony Burgess Centre at the Université d’Angers.